RepairDesk allows you to charge tax on cost of a part as in a few states such as Florida and Michigan you cannot charge tax on entire labor. For example, there is a repair job of $100. The cost for part is $25 and Tax is 10%. If Tax on Cost Part is enabled then it would calculate tax as 10% x $25 = 2.50 and the sale price would be $102.50. 1. Head to Settings >> Module Configuration >> Repairs. 2. Select the option Charge Tax on Part to charge tax on part cost. 3. 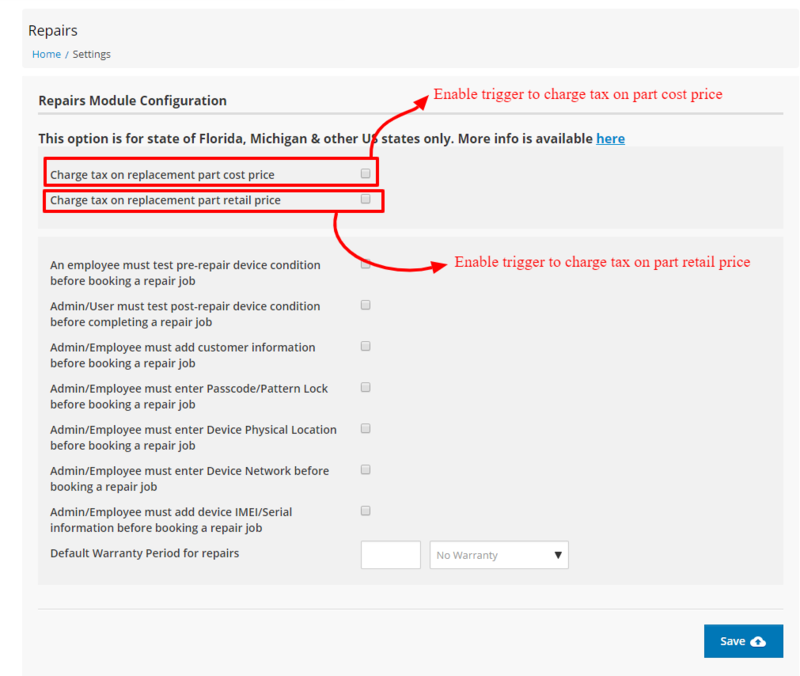 Enable the checkbox titled Charge Tax on Part Sale Price to deduct tax from the sales price of a repair part. 4. If you are enabling Charge Tax on Part Sale Price make sure to select Charge Tax on Part option as well. 5. Finally click on Save to preserve these changes. Note: only one trigger can be enabled at once.user can either charge charge tax on Part cost price or Part retail price.